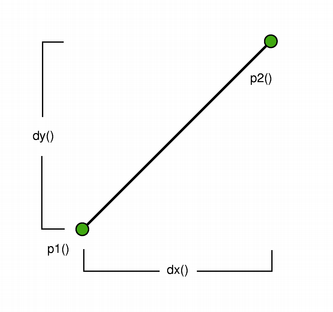 The QLine class provides a two-dimensional vector using integer precision. A QLine describes a finite length line (or a line segment) on a two-dimensional surface. The start and end points of the line are specified using integer point accuracy for coordinates. Use the QLineF constructor to retrieve a floating point copy. The positions of the line's start and end points can be retrieved using the p1(), x1(), y1(), p2(), x2(), and y2() functions. 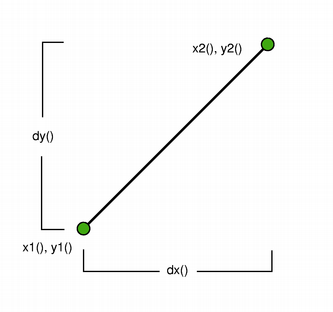 The dx() and dy() functions return the horizontal and vertical components of the line. Use isNull() to determine whether the QLine represents a valid line or a null line. Finally, the line can be translated a given offset using the translate() function. See also QLineF, QPolygon, and QRect. Constructs a line object that represents the line between p1 and p2. Constructs a line object that represents the line between (x1, y1) and (x2, y2). Returns the line's start point. See also setP1(), x1(), y1(), and p2(). Returns the line's end point. See also setP2(), x2(), y2(), and p1(). Returns the x-coordinate of the line's start point. Returns the x-coordinate of the line's end point. Returns the y-coordinate of the line's start point. Returns the y-coordinate of the line's end point. Returns the horizontal component of the line's vector. Returns the vertical component of the line's vector. Returns true if the line is not set up with valid start and end point; otherwise returns false. Sets the starting point of this line to p1. See also setP2() and p1(). Sets the end point of this line to p2. See also setP1() and p2(). Sets this line to the start in x1, y1 and end in x2, y2. See also setP1(), setP2(), p1(), and p2(). Sets the start point of this line to p1 and the end point of this line to p2. Translates this line by the given offset. Translates this line the distance specified by dx and dy. Returns this line translated by the given offset. Returns this line translated the distance specified by dx and dy. Returns true if the given line is not the same as this line. A line is different from another line if any of their start or end points differ, or the internal order of the points is different. Returns true if the given line is the same as this line. A line is identical to another line if the start and end points are identical, and the internal order of the points is the same. Writes the given line to the given stream and returns a reference to the stream. Reads a line from the given stream into the given line and returns a reference to the stream.